My first fiber reactive dye experiments were the primary colors from my starter kit. My next step, was to mix the secondary colors from them. Rather than experiment randomly, I tried to see if I could find any information on color mixing with Procion MX dyes. I found this chart at the Jacquard Products website. You can either view it online or download a pdf copy. The chart is useful because it gives recipes in both kitchen measurements (teaspoons) and also parts for metric. What wasn't useful, was the use of names instead of photos to identify the colors. That meant I had to choose recipes based on names. All I wanted was orange, purple, and green, but wow there were a lot of choices. I confess that I was not exact in following the recipes, but this was because I didn't have the required colors. I substituted the colors in my started kit instead. Nor did I follow the proportions perfectly. I used teaspoon measurements, but since I am working with small amounts of fiber, I used 1/4 and 1/8 teaspoon measurements according to the parts required for the recipe. I rounded the parts to be workable with quarter and eighth teaspoons. Each color was left to soak in it's dyebath at least two hours. All About Hand Dyeing. You can either view or download that chart here. The question that comes to mind next is, what would happen if I switched the proportions in the recipes? I'll let you know! This is so WAY cool! I am living vicariously through your blogs, Leigh! Between kittens and sheep I haven't had much time for blogging and have been trying to catch up on your posts. Keep 'em coming! I'm a "challanged" when it comes to cotton spinning and dyeing. Those colors are wonderful, especially the "shamrock," which looks rather like an 'aqua teal' to me. Beautiful. I think there is some kind of chart for Procion, but for the life of me I can't think of where it is. Thanks for sharing your results. I really like the plum. Thank you, all! I have to admit that teal greens and purples are my favorite colors. Patrick, if there's a chart out there, I'll do some googling to see if I can find it! Oh, How Pretty! What a fun experiment! T.
Can't wait to see the yarn you spin from these fibers. Great Colors!!! can see you are looking for procion mx charts, try to look at this site: WWW.pburch.net Paula Burch knows so much about dyes and here site has been my companion for the almost 10 years I have been dyeing. She also has a forum site it can be found under favorite links The dye Forum. Hope you can use this. Procion, thank you so much for visiting and leaving a comment. 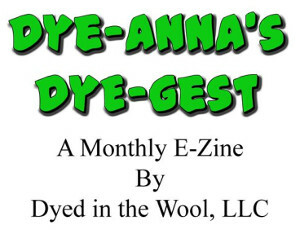 Paula's website is a wonderful resource; I've linked to several of her pages in my dyeing posts. I haven't looked much at her dyeing forum, but is sounds as though I definitely need too.